What’s just a little bit more crazy than drag racing? How about drag racing on an oily track… on purpose? We recently got to see what happens when your drag strip colleague forgets he left a near empty oil can on the engine block and then took a burn down the track, leaving a long, proud slick on the pavement that would move any prudent driver to avoid any participation with a race car under such conditions. But some racers are not so careful. Take drag racers Jeff Lutz and Big Chief. When Lutz managed to sully the track with oil, it was Big Chief who had the opportunity to avoid the perils of racing on an oil slick. But guess what he did instead? 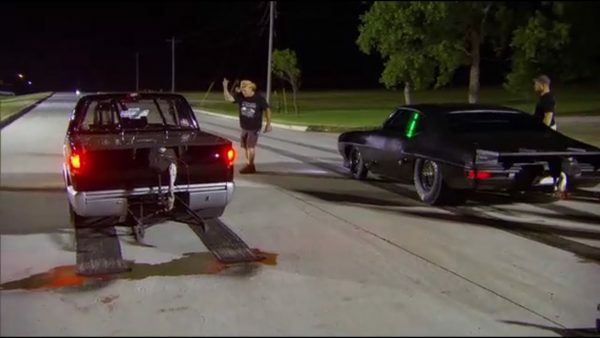 “Just because we’re dumb asses, don’t mean you can be too,” reads the disclaimer at the beginning of the footage by Street Outlaws. Of course, we’ll forgive the poor grammar in favor of the craziness we get to enjoy. And judging from the results, it seems that sometimes a little dose of crazy goes a long way toward some positive results. Maybe the only redeeming factor is that most of us do not have access to extreme high performance drag racers, so even if we did encounter an oily track, we would’t be able to try on our stupid pants and give it a go. There’s a natural order to things, you know.